Is that a pineapple or a pine cone? - Many people are puzzled by the figure under the main entrance underpass at "Providence's Little Italy". In fact, hanging from the underpass is "La Pigna", an Italian symbol for hospitality and for sharing of abundance. Businesses at Atwells Avenue resembled the "Old Country. They were conducted on the street level spaces and the upper levels were used as residencies (much like in Italy). 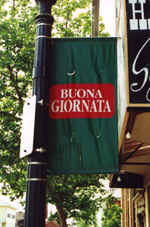 That area became a center of business and culture for the new Italian population. Today, Federal Hill is known as a hot spot for its dinning and upbeat rhythm. One can dine in an authentic Italian restaurant as well as shop for Italian goods directly imported from the "Old Country". Many people have compared Federal Hill with SoHo in New York for its cultural mixture and activities. A good time to visit Providence's "Little Italy" is in March 19 when the feast of St. Joseph is celebrated. At this time you will find the famous "Federal Hill Zeppole" (similar to the Zeppole made in Sorrento).